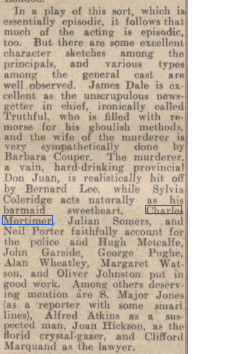 Charles Mortimer played Inspector Stainer in "Murder Gang", at the Embassy Theatre, London, in 1935. The stage consisted of a multiple stage erected for 17 scenes. 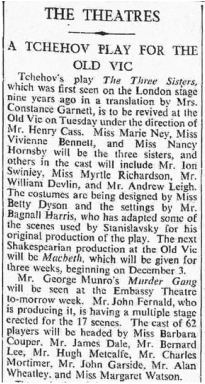 The cast was 62 strong, and also included Miss Barbara Cooper, Mr James Dale, Mr Bernard Lee, Mr Hugh Metcalfe, Mr John Garside, Mr Alan Wheatley, and Miss Margaret Watson. 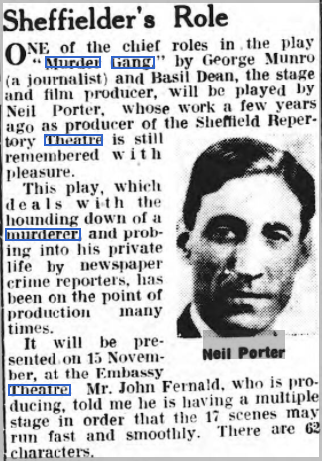 From The Sheffield Independent - Wednesday 06 November 1935. 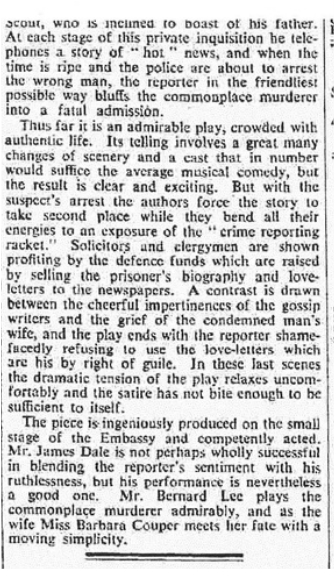 From The Hendon & Finchley Times - Friday 22 November 1935. With kind of permission of the Times. From The Era of 6 November of 16 November, 1935. "MURDER GANG,” the long- promised play dealing with the inside story of the tracking down of a murderer, is at last to be presented at the Embassy Theatre on November 15. It was written some years ago by George Munro and Basil Dean, who had a great deal to do with the technical side of the writing of the play, and has been described by Mr. Munro as "a tale of murder from the reporter’s angle.” It will be one of the biggest productions ever undertaken by the Embassy, with sixty-two characters and seventeen scenes. A multiple stage has been installed so that the continuity of the play may be as smooth and fast as possible, and John Fernald, the producer, is working night and day to get things ready in time. The tremendous cast is headed by Barbara Couper, James Dale, Bernard Lee, Hugh Metcalfe, Alan Wheatley Neil Porter, Charles Mortimer, John Garside, Oliver Johnston, and Margaret Watson. From The Era 20 November, 1935. “Murder Gang” at the Embassy. 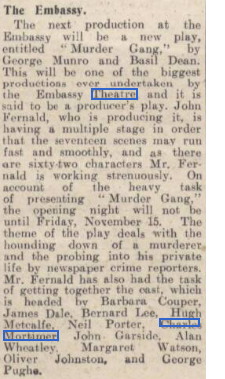 The actual production of the much-postponed and almost legendary play, Murder Gang.” by George Munro and Basil Dean, at the Embassy last week has given us the harshest and most realistic picture of a certain section of Fleet Street’s activities that has ever been staged. It shows the way in which a murder is followed up by the crime reporters of big national newspapers, the manufacturing of sob-stories, the interviews with distant acquaintances the dead person which turn up in the next edition as first-hand information from a dear and close friend, the persecution of relatives, the hounding down of the criminal (here, for the sake of drama, done by one of the reporters, ironically named Truthful, and excellently played by James Dale), the bargaining for life-stories of the condemned, the procuring of private letters, the pestering of the murderer’s wife for messages—all the usual concomitants of crime-reporting and a few unusual ones thrown in for good theatrical measure told rapidly and forcefully and, up to a point, written with a steadily observant and seemingly dispassionate detachment. Both dramatically and as an indictment of Fleet-street, its methods, standards, and public, this is the strongest part of the play; but in some curious manner, when Truthful. the most remorseless and gogetting reporter of them all, begins to feel revulsion and horror of his job the play seems to weaken and a strain of artificiality creeps m However, there is no artificiality about the drawing of the murder gang,” who look and behave as they were born and bred in Fleet Street (their very hats and overcoats are startlingly authentic); the acting, including that of Bernard Lee, Barbara Couper, and Sylvia Coleridge, is very good indeed, and John Fernald’s production of this seventeen scene, sixty-character drama on the little Embassy stage is done with wonderful imaginative skill The play must be transferred to the West End, and with the same cast. From The Aberdeen Journal, 26 November, 1935. So successful has the production Murder Gang," the dramatic play '' behind the scenes' of newspaper reporters engaged on a murder case, by George Munro and Basil Dean, the stage and film producer, proved at the Embassy Theatre that the run is to be extended for another week. There is every hope that the play will be transferred to the West-End soon as a suitable theatre can be found, writes our London correspondent.